1. Heat the vegetable oil in a wok, add the chicken strips and stir fry over a high heat for 2-3 minutes until golden brown. Leave to one side to cool. 2. For the dressing, heat the oil in a wok over a medium heat, and stir fry the chopped garlic, onion and ginger for around thirty seconds - until the garlic begins to colour. Add the peanut butter, sesame oil and water, increase the heat and stir until the sauce takes on a creamy texture - about a minute or so. Season with a dash of soy sauce and a pinch of salt and black pepper and leave to cool. 3. In a separate pan, cook the udon noodles in boiling water for 2-3 minutes, before draining and tipping into a colander, Rinse through with warm water - this helps get rid of any extra starch. 4. Divide the noodles into 4-6 plates. 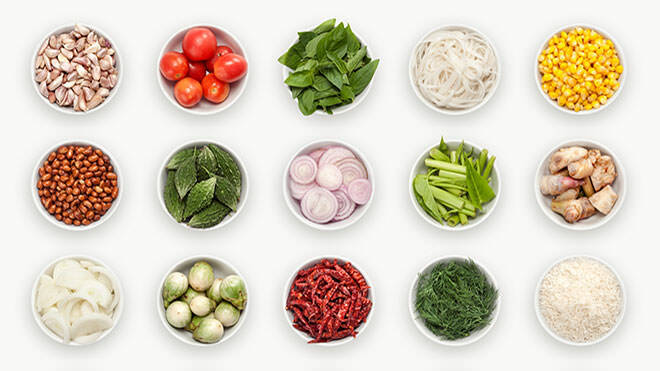 Mix the salad ingredients together and arrange in a rough heap over the noodles. Top with the cooked chicken and drizzle over the dressing. Just before serving, sprinkle with toasted sesame seeds.